A decadent grain-free cookie-like bar. Preheat the oven to 350F and line a 9-inch square baking dish with parchment paper. In a large bowl combine the ground chia seeds and water, and stir well until a gel-like texture starts to form. Add in the almond butter, coconut sugar, vanilla, baking soda, and salt, and stir again until a thick batter is created. Fold in the dark chocolate chips. Bake until the top is lightly golden, about 20 minutes, then cool completely before cutting and serving. 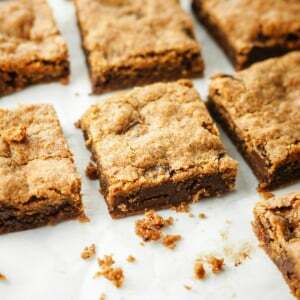 The blondies become more sturdy as they cool. Slice into 16 squares and serve at room temperature.